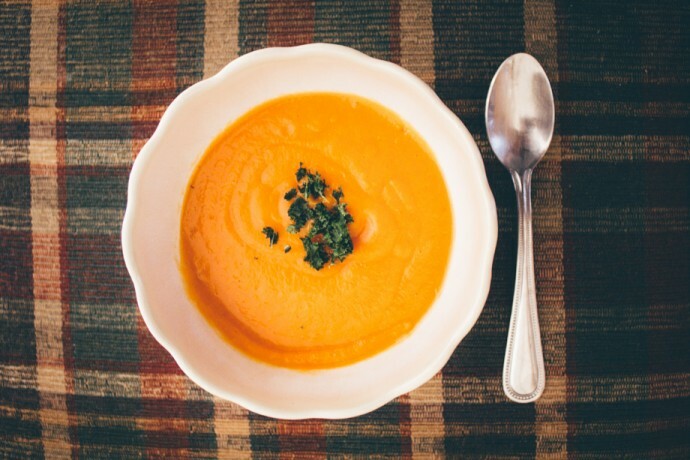 Fall is the perfect weather for soups and I’ve been in LOVE with this easy and healthy creamy carrot soup. The ginger adds the perfect punch while adding warmth for those chilly days. All ingredients I used are organic and conveniently delivered from Door to Door Organics! Use a blender to puree all the ingredients to create a creamy soup! Water and potato ratios can be altered to change the consistency of the soup. Other fun ingredients to try are: curry, coconut milk, or cumin to create new flavors. The soup can also be topped off with cheese, plain greek yogurt, or green scallions! Get $10 off on your first order from Door to Door Organics with our special link: click here! Congrats on being one of our winners! And I’ve never had chickpea soup… will definitely have to try it in the future! PS We will be emailing you more details on your prize! This looks incredible! Love ginger. My favorite fall soup is a pumpkin chili! Congrats on being one of our winners! We will be emailing you more details! Also that chili sounds delicious! 614 bloggers and best friends... here to share what life and Columbus have to offer! Read more here to learn what we're all about!